The drive out to the Brown’s Ranch trailhead was beautiful with the sun rise and a few clouds dotting the sky. It was early Sunday morning and a new trail had been opened up in the area. We decided to hike Granite Mountain Loop, one of the many trails in the Sonoran preserve's northern area. Although the elevation change is only a few hundred feet we saw a difference in the wildlife and plant communities. There was a jack rabbit, mule deer, squirrels and many quail. The trail circled and climbed around Granite Mountain, with views out to the Four Peak mountain range in the east. We had a great time. I love the crunch of fresh veggies and sprouts in a salad especially after a good workout. Later that day I knew I wanted something fresh and tasty with a lot of flavor. I thought of the Pad Thai I had for takeout a few days before and this brought about the idea of a semi-wilted salad using the same type of ingredients. I used brown rice noodles which were cooked for only a minute or so and then rinsed in cold water. Garlic, ginger and shrimp were stir fried together in the wok, and then the salad ingredients were added with the dressing. Using tongs I turned the mixture in the wok a few times until everything was covered with dressing. The salad was quickly removed and garnished with chopped peanuts, cilantro and parsley. Crushed chilies could be added to the dressing if you like the heat. I like to start out a dish like this by having all my ingredients, chopped and prepped beforehand. Add the ingredients of the dressing in a small bowl, whisk until blended, set aside. In a large pot; bring 4 quarts of water to a boil, add the brown rice noodles, turn off heat. Stir noodles gently and remove from pot 1 to 2 minutes later from heat. Drain and then rinse under cold water, set aside. Heat wok over high heat. Add 2 teaspoons peanut oil, garlic, ginger and shrimp. Cook until shrimp are opaque; about 2 to 3 minutes. Remove shrimp from wok. Add bell pepper, green onion, sprouts, celery, cilantro, basil, noodles and dressing, stir with tongs until completely covered with sauce, add shrimp. Remove from heat. Enjoy! your photo looks like a postcard! Oh, Cheri, I absolutely love pad thai. I love how you've stripped this down and made it a really fresh and simple version. Especially love the toppings! Your walk looks incredible! So different to Oregon but no less beautiful! 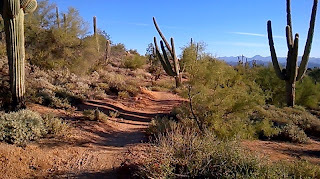 Hi Helen, we had a great walk, the desert is beautiful in it's own way especially in the wintertime. Awesome idea for a salad, I love pad thai and I can imagine that would translate into a beautifully flavoured salad. Love your hike photo too! What a beautifully different landscape! I have spent time in the Australian bush, and passed through Californian deserts, but this looks like something new and exciting entirely. What a beautiful day you must have had. And to follow it up with a delicious salad - the perfect end! Thanks Amy, you are right, we had a really nice day. Cheri I am loving this pad thai salad packed with all sorts of goodness!! Makes my mouth water! That photo is beautiful! We love hiking and experiencing all there is to see along the way. I love pad thai but haven't made it at home. This looks delicious and I love the shrimp. Thanks Cindy, we walk everyday and try to go on a nice long hike once a week. Thanks Dena, you are so kind! This looks soooo delicious! I am definitely making this! Thanks Karen, we really enjoyed this! Thanks Tandy, we love to hike on the week-ends! Dear Cheri, what a lovely Pad Thai Salad - have not had Asian fare for a while and I am sure that I would really enjoy this salad so much - what an inspired idea to be combining Pad Thai and an Asian-inspired salad into one. Thank you for sharing your wonderful recipe! Hi Andrea, I have been on a salad kick lately, kind of strange as now we are in the middle of fall. Thanks for stopping by. I love Pad Thai Salad and that hike...sounds like you had an amazing time! Thanks Mike, we are big hikers here. I have never made pad thai before. Yours looks very inspiring and delicious! Gorgeous photos, Cheri! This dish looks so beautiful and I love all the healthy ingredients. A beautiful hike and a fantastic dinner = perfect day! Thanks so much for sharing. Thanks Robyn, it was my favorite kind of Sunday! I love recipes like this and can't wait to try it. I'll have to stop by the Asian market first because I don't want to leave out any of those delicious flavors. Thanks Cathy, we have a couple of great Asian markets here in AZ and the prices seem very reasonable. What a great photo! And what an awesome dish -- tons of flavor, and really healthy. Can't beat that combo, can you? Good stuff -- thanks. Thanks John, we enjoyed it! Great dish, saving recipe for warmer weather. A nasty cold front heading our way. Hi Norma, the weather is already beginning to sound like last year with the vortex, wish you the best. I have done that hike and loved it! That is a great picture you posted of it. Your salad looks so good, too. It has so many interesting flavors in it. I bet it tasted wonderful after your adventure in the desert! Hi Shari, did not you like to hike, sounds like we have another activity in common. Oh what a lovely hike you must have had. That picture really does look like a postcard. And that Pad Thai Salad, oh my. Healthy, refreshing and just the right touch for such an adventurous day! Hi Louise, oh we did have an adventurous day, so much fun. Thanks for stopping by! I simply love pad thai and this salad is definitely gonna be a win win at my place.. love it!! Working out always makes me want to eat better. This pad thai salad sounds absolutely delicious! Great post-workout fuel. I know what you mean, I always eat better too! I always enjoy pad thai noodles and now this salad version, wow!!! So many ingredients and flavours working together for an explosive goodness! Thanks for sharing this, Cheri!!! Just checked it out Francesca, thanks! I always love your hike pictures :) And this pad thai salad looks incredible! Thanks Phi, we love to hike. I've spent time hiking in Arizona with my family a few times on vacations this year and it's so beautiful -- this photo reminds me of that! Your pad thai salad looks so colorful and delicious! Thanks Marcie, there are some really nice trails here! 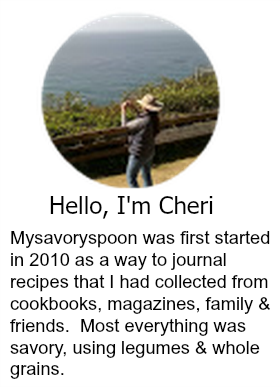 Hi Cheri, oh my! This pad thai is so tasty and refreshing. I had tried a few times in Thai restaurant but have never made one. Perhaps to try it out one day. Thanks for sharing and have a great weekend ^-^!. Thanks Karen, you too! Happy week-end! I love pad thai and this salad looks insanely good Cheri! I used to live in AZ - your picture makes me miss it. Thanks Reeni, love AZ in the winter! I too adore pad thai! Yours looks authentic and very delicious, Cheri. Yes Ma'am, this would do the trick for me! I really enjoy pad Thai but I rarely make it at home. Thanks Maureen, Thai food is my favorite! Super photos and a great salad. I tend not to make things with so many ingredients because I live alone....really must try this over the holidays when I'll have company! Thanks Barbara, Happy week-end to you! What a beautiful walk you had. It's amazing, I agree, how just a few hundred feet of elevation change makes such a difference in what you see. And your pad thai looks so healthy and delicious! Hi Susan, I know it's kind of crazy, thanks for stopping by. Happy week-end! Lovely pictures and most amazing shrimp meal! This looks like my type of salad.... yum! My kind of food. 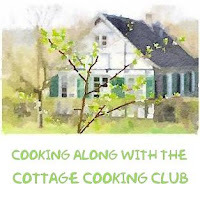 Love the recipe and your photos are so wonderful. I think taking a lovely walk along that trail would be so great...Nature is so pretty. Thanks Linda, we love to hike, especially in the winter! Sounds like you had a wonderful hike, Cheri! Your salad looks so good and the dressing sounds great, too! Hi Cheri, looks fantastic! And, having lived in Arizona for a number of years myself, I so enjoy revisiting the memories of trails and journeys enjoyd so many years past!